The original landscape for this painting had a textured rock pattern that I applied with very thick gesso. I repeated that technique on this new board as well. 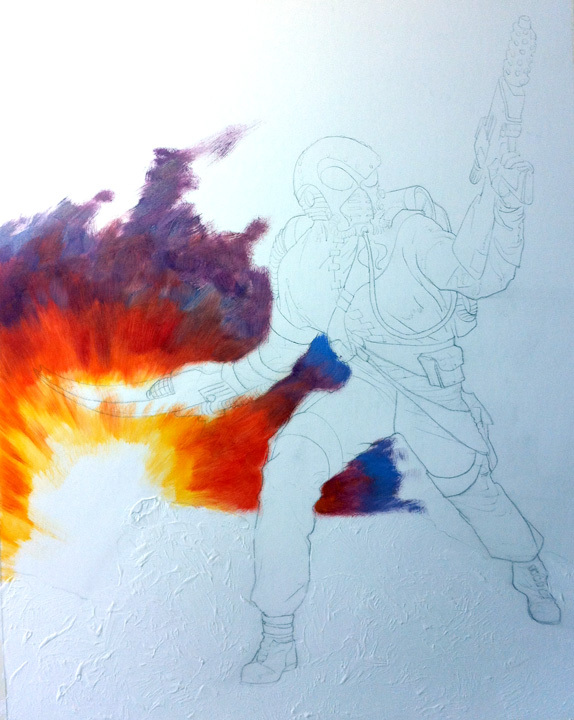 Here I start laying in some of the b/g colors, starting with the explosion in the mid left. 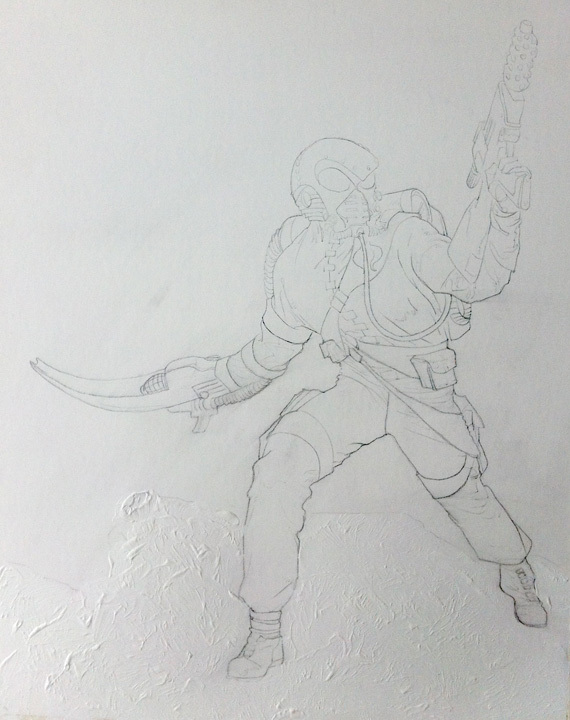 The b/g is almost complete at this point with the main figure clean so that when I add color to the figure, it will be unencumbered by underpainting. 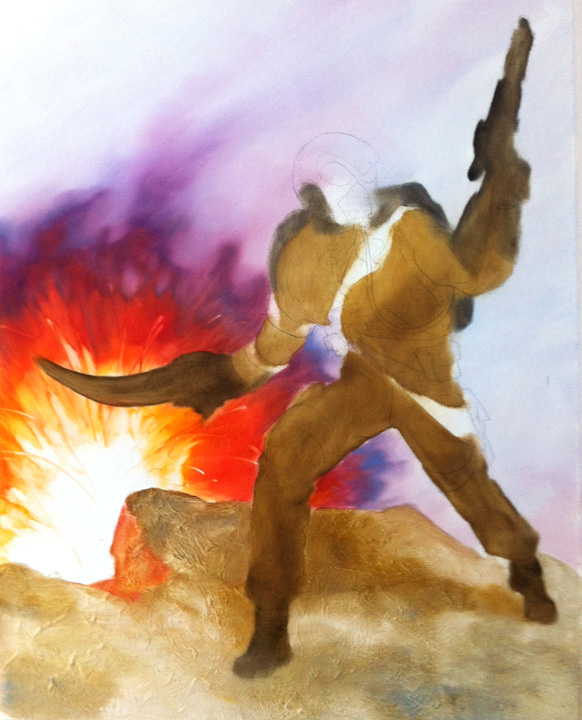 After the b/g dries, I now lay in the underpainting for the basic colors of the figure. Continuing similar to the previous photo, I lay in the rest of the colors for this figure. With the basic tones being laid down in oils, I now begin the detail work with acrylics, starting with the head and moving downward. 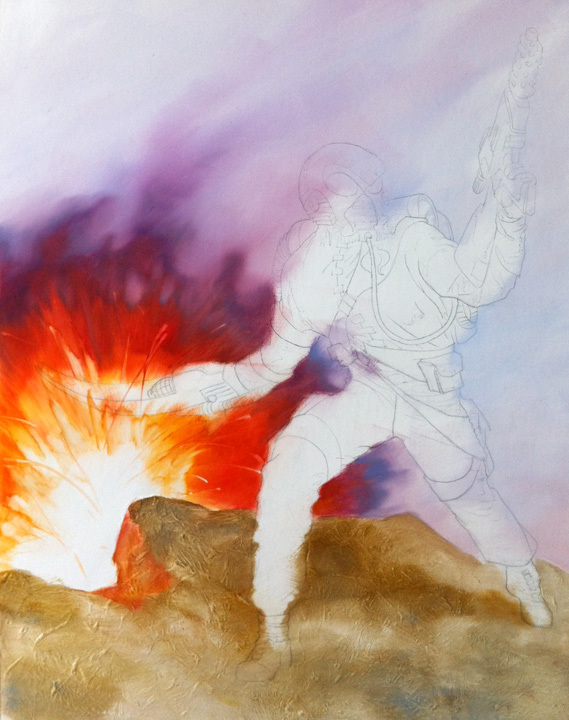 Work continues with the acrylics, adding more detail to the body and his equipment. At this point, I've completed some of the finer shadowing details and refinements with various shades of gray markers. 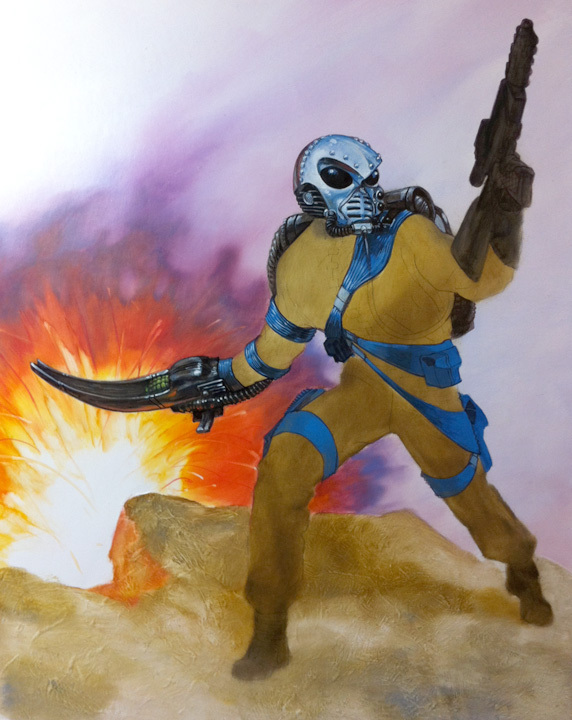 You'll note final details on the ground and some color corrections for the background. The above is the finished piece. This piece was 16″ x 20″ oil, acrylic and marker on gessoed illustration board. It is the exactly the same size as the original Hasbro artwork. If you have comments or questions about this piece, please feel free to post them here. As always, I thank you for your time and interest in my work. 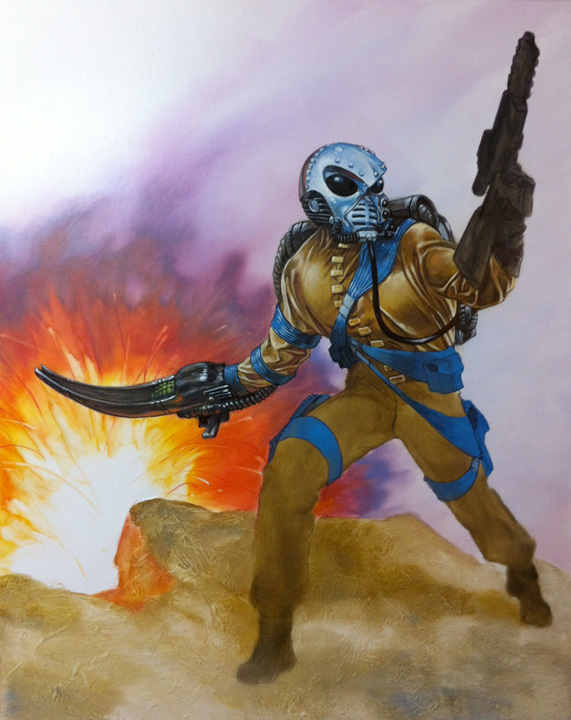 This entry was posted on February 10, 2012 at 1:15 am and is filed under Action Figures, Blog, Blogger, Collectibles, Collections, Collectors, Comic Book Artist, DAVE DORMAN ART FOR SALE, DAVE DORMAN NEWS, Facebook, Fan Culture, Figurines, Geek, Geek Culture, GI Joe, Hasbro, Holiday Gifts, Illustration, Military, Military Art, Nerd Culture, Painting, Pop Culture, Sculptures, Toys with tags Action Figures, Art, Board of Directors, Cobra, collectibles, Collecting, Entertainment, Figurines, G.I. Joe, Geek, Go Joe, Hasbro, Illustration, Military Art, Nerd Culture, Nerd Gifts, paint, Pop Culture, Recreation, toys. You can follow any responses to this entry through the RSS 2.0 feed. You can leave a response, or trackback from your own site. Thanks for sharing this! As a design/illustration student, I find these step-by-steps just precious. Interesting how you did the textured rock pattern. Thanks. 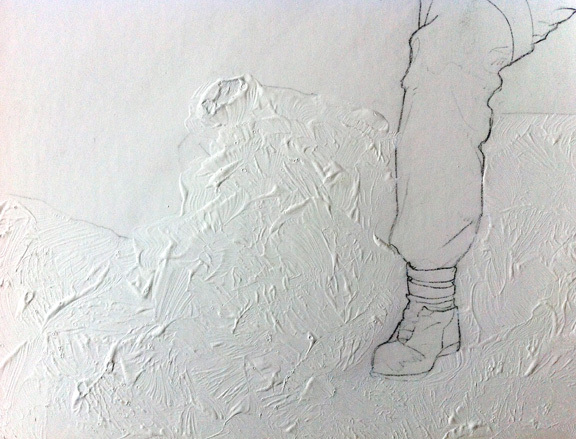 Gesso is a gift! I am willing to recreate any characters. As for all of the characters I’ve done for Hasbro, it’s about 150, so it would take me a while to make a list. Really cool stuff Dave, thanks for sharing some of your commission work with us! Why do you do the basic tones with oils and the detail work with acrylics? i would imagine it’s easier to get ‘finer’ details with the acrylics since oils can at times be a bit globby and hard to control in small, tight areas. Actually, I thin the oil paints so much that I get great detail with the oils as well. If you have any questions about my technique, feel free to ask me. I’m not secretive about my rather unorthodox methods! awesome! thanks for sharing this with us 🙂 as a beginner in painting military and historical figures, i learned tons! I’m rather curious about the acrylic-over-oil thing, too. How do you manage to get the acrylic to stay put over an oil base? Because I lay the oils on fairly thin to the gesso board, there is some “tooth” to gesso available through the oil for the acrylic to hang onto; if the oil is laid on too thick, it causes a waterproof barrier, thusly, the acrylic has nothing to hold onto. Just use trial and error to figure out how thin you can go with the oil, but be sure to let it dry before you lay on the acrylic.